You'd think this battle of earbuds would be no contest -- pitting XtremeMac FS1 High Definition Earphones that cost $149.95 against Griffin TuneBuds that only set you back 20 bucks. But I've just finished testing both on my iPod shuffle, and I was surprised by the outcome. The FS1 package is an attractive one (bottom image to the left). You get very stylish earphones that fit comfortably. XtremeMac includes silicon and foam sleeves plus a set of flanged tips. So you're bound to find something that's perfect for your ears. Plus you get a very nice zippered carrying case. One of the selling points of the FS1 earphones is that you get balanced sound at low levels of volume. This is true. And listening to music at a lower level is bound to be less harmful over the long haul. But XtremeMac's claim of deep bass was not apparent to me. In fact, these earphones produce sound quality that I characterize as "cool" -- a bit too much treble response. This was especially apparent with rock selections with lots of cymbals. In fact, on some songs, I couldn't turn up the volume because the excessive treble response would bother me. I then attached the TuneBuds to the shuffle via the USB port as designed. This is a slick trick because you still have your standard earphone port available. Two people can listen to music at the same time -- one through the TuneBuds and the other with standard earphones. This function also made comparing the FS1 phones to the TuneBuds easier. Overall, the TuneBuds sound very similar to the earbuds that come with the shuffle. The sound is "warmer" than produced by the FS1 earphones, and there's definitely more bass. The USB port connectivity that enables two people to listen to one iPod is a welcomed bonus. The TuneBuds cost less than Apple's original earbuds, yet sound as good. I should also note their design. You have fewer wires to wrangle with because the earbuds are incorporated into the lanyard. Very handy for active folks. Considering that you can buy 7 sets of TuneBuds for the price of one set of FS1 earphones, I'd have to say that the TuneBuds are clearly the better value. And for my ears, they sound better too. I'd recommend that you listen to the FS1 earphones first if you're considering picking up a set. I could see some folks preferring the very clean sound at low levels. But, if you like the way your existing Apple earbuds sound, you can buy the TuneBuds sight-unseen. I think you'll be happy. There's the "prime directive" in buying audio equipment: if you can't hear the difference, don't pay for the difference. Even better here where you think the less expensive set sounds better. Thanks for the post. I've been happy with my etymotics - particularly for air travel - but these might be a good "kick around" pair. I don't know, Derrick. I found your review from my RSS reader and I just don't get where you're coming from. I'm a live sound engineer and I heard the FS1 at the AES conference in NY and was totally blown away by the incredible depth and accuracy. I liked them enough to write it down which I never usually bother to do. Of course it is what you like, but it seems to me that you didn't have them in well enough to get that seal you need for the bass. 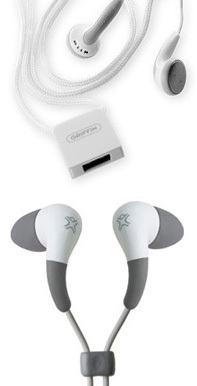 An outer earbud compared to an in-ear earphone? Maybe you have a different issue there with fit or something. Yea, I heard them at a booth with a little Shuffle and the FS1 sounded incredible, but they weren't selling them at the time. Hey Mike, It does come down to what your ears like. I tried to like the FS1s, really. I don't like writing lukewarm reviews about products. But I do acknowledge that other people will like them. That's why I recommend that they listen to them first if considering buying. I'll also note that I read the instructions throughly that came with the FS1s and did things like turn off the EQ when testing on other iPods, such as the nano. For my ears, they lack warmth and richness. For yours, they could be the best ever. Would you pay $150 for them? Now that I see that they're available, I just ordered a set. I'll let you know if there is a diff between what I heard and what I get. How's that? For the money, they blew away the other stuff that was all hype at the show. Just a different market, I guess. Especially when most of the better stuff is like 199+. Maybe comparing the 150 FS1 to the 500 - 1000 dollar ones might be cool, too. Thanks for posting the reply, too. I'll be reading more on your site now. The plot thickened this morning. I've been exchanging mail with the director of marketing for Future Sonics Incorporated. He's going to send me a replacement set of FS1 earphones for retesting. He's baffled by my comments about the lack of bass response for the set I have now. So, more to report as soon as I get the new FS1s. Whats happening, I arrived at this website by on accident when I was looking on Google then I came upon your site. I have to tell you that your site is interesting I really like your theme! donâ€™t have a lot of time at the moment to go through your sitebut I have bookmarked it. I will be back in a day or two. Thanks for a great site. Its nice to see you posting on this topic, I should book mark this website. Just keep up the good work.